National Collegiate Athletic Association president Mark Emmert held a pre-Final Four press conference Thursday that was described as “testy,” “defiant,” a “filibuster” and “one long, sonorous fart noise.” Criticism aside, what did the most popular man in college sports actually have to say? Emmert: First of all, I wanted to talk about the changes that have been going on and we’ve been engaged in in the NCAA. I guess anyone would describe this as a challenging, dynamic, occasionally difficult time in intercollegiate athletics, but at the same time it’s one of dynamic change, one where we’ve got people all across the association being involved in driving some significant changes … while there’s always people that don’t like change when it occurs, the fact of the matter is that change is what we’re about in the NCAA right now and we’re trying to work our way through some very, very difficult changes to make the whole notion of intercollegiate athletics strong and viable going into the second century of the NCAA and of college sport. Emmert: This is the so‑called miscellaneous expense allowance, the proposal to allow schools to, at their option, increase the value of scholarships an additional $2,000 to cover what’s referred to in higher education jargon as a ‘miscellaneous expense,’ sometimes confused with ‘pay for play,’ which is absolutely wrong. It is to cover the real cost of attendance and only the real cost of attendance for a student‑athlete. Emmert: There’s been a piece in the past day or two talking about my experiences, my past stops. You need to know this, and I don’t expect to spend any time on this today, but the fact of the matter is that everywhere I’ve been, I’ve been asked by boards or other bosses to help drive change. I’m very proud of the changes that have been made at every place I’ve ever been along the way. 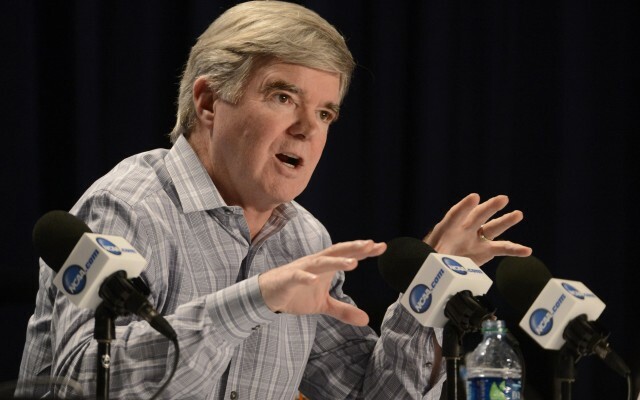 Emmert: If you’re not getting sued today, you’re not doing anything. I don’t know anybody that doesn’t have litigation pending. Emmert: We’re an athletic association. We don’t accredit academic institutions. We don’t go into the classroom and say, ‘we don’t like the quality of this degree.’ That’s not the job of an athletic association. Emmert: Yeah, the Rutgers case in particular is such a new case, I haven’t spent any time looking at it. I saw the video, like most everybody did. I find that video pretty appalling, to say the least. At the least, I think it requires us to have a conversation. Emmert: The Miami case is obviously a significant blow to the confidence people have in enforcement, and we’ve worked very, very hard to be as open and frank about that case. We’ve dealt with it directly. If we have to change, continue to change, the culture of enforcement, that’s certainly on me and something I’m working hard on. Emmert: I don’t think the Ohio State infractions case caused a loss of confidence in the enforcement process. Emmert: First of all, I think it’s very important to recognize in that case at Auburn, what there is is a newspaper story. That’s it. We haven’t done anything with that case because we don’t know anything about it. What we know is what we read in the newspaper. Emmert: We’re not a state actor, don’t want to be a state actor. There will always be limitations to what can and can’t be done. Emmert [to CBS Sports writer Dennis Dodd, who has called for Emmert's resignation]: Thanks for the job advice. Kept my job anyway. English: “Whooo! S–k it, haters!